Balsam Bash by the Ribble! Fancy wiling away a summer's day by the cool and calming waters of the River Ribble? - and helping preserve its fantastic riverbank habitats by Bashing some Balsam while you're there?! 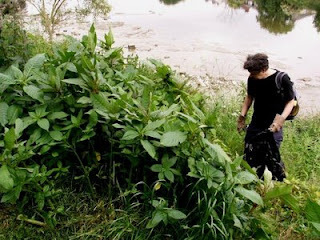 This Friday, 3rd July, Ribblesiders are removing the harmful invasive species Himalayan Balsam from the next stretch of the riverbanks which need our attention in Penwortham. Local residents, with help from the Action Ribble Estuary tributary of the Mersey Basin Campaign, hope to clear another good stretch of the Ribble's banks, starting beneath the railway bridge on the opposite bank to the New Continental pub and working upriver from there. You could even retire to that excellent local hostelry for a well-deserved drink afterwards! We are meeting at the Margaret Road playground's car park at 10am this coming Friday, and planning to bash Balsam until 4.30pm or so. You are welcome to join us for the whole day or just a couple of hours, it's up to you - any help you can offer will be fantastic! - and you get the perfect excuse to spend some quality time by the Ribble! If it's sunny, it would be advisable to wear a hat and sunblock - especially if we get a heatwave as predicted! Bring a raincoat if it looks like rain, and wear stout shoes or boots. Either way, bring yourself a bottle of water and a snack - and if you're staying for the day, bring a picnic to enjoy by the Ribble! Himalayan Balsam is not a native plant but a garden import gone mad! On its own it is quite an attractive plant, growing anything between 1 and 3 metres tall and producing an abundance of pretty pink-mauve "snap-dragon" type flowers from mid-summer onwards, so it's easy to see why it was imported... but each plant also produces eight hundred easily-germinating seeds which literally explode out of the ripe seed pods and rapidly spread and swamp everything in their path. 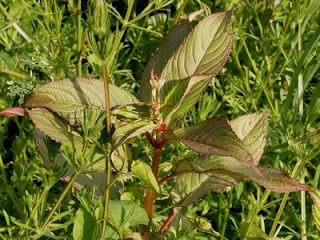 This means that the Ribble's natural plant species and therefore the biodiversity of the riverbanks, where this invasive plant spreads so rapidly, are seriously under threat. 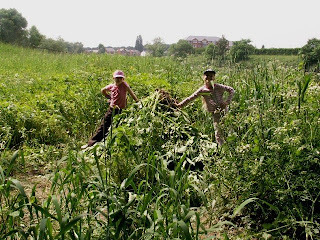 The Balsam has to remain on-site to rot down naturally. It CAN'T be removed from site as it might then spread elsewhere... just one seed would lead to thousands of plants within a couple of years. Uprooting just one plant will prevent 800 more next year, and 640,000 plants the following year!! Over the past couple of months, many local people have got in touch to share their feelings, memories and concerns about the Ribble and its green spaces. Some have also sent in some really beautiful photos. Several people have also asked if we are arranging any events over the coming weeks, and we're pleased to report that we are organising our yearly Balsam Bash for Friday 3rd July AND have again been invited to take part in the Ribble Coast & Wetlands Walking Festival in October, so more details will be on the blog soon! In the meantime, enjoy these little tasters of Summertime by the Ribble, and get out yourselves as much as you can - the summer weather so far has been pretty good, and we are spending our evenings and weekends relaxing by the Ribble instead of blogging it! - although JB and a couple of other people have mentioned that there seem to be less House Martins returning this year, as there are a few mud houses which haven't been rebuilt, and there seem to be fewer Swallows than usual hunting over the river and nearby meadows. Yet Razzi B of Lower Penwortham has actually managed to get a photo of these incredibly speedy creatures! - as well as a cracking picture of the midges they feast on! (Rather the Swallows eating the midges than the midges eating us). Geoff has been in touch recently and has known the Ribble very well for many years. He has mentioned many interesting things he has seen and experienced, from the source of the Ribble to the sea. He has been caving in Alum Pot and other caves near Ribblehead ("we went to Upper Long Churn cave and though to the bridge in Alum Pot: it's interesting that the water goes under the Ribble into Turn Dub which then empties westward into the Ribble") and has watched the big ferry boat which used to come into the docks just managing to escape from the docks before the river was too silted up to run it any more. Geoff feels very strongly that the Council's recent idea of dividing the dock in half and building on half of it would be a very bad if not fatal procedure for the dock basin. It would, he says, "be a tragedy not to somehow use the unique potential of the dock, it is something that Preston has to exploit for its pride, inhabitants, visitors and eventually financial advantage. It is a shame that so much is in the hands of people who do not seem to value the history of the river." Geoff is planning to dig out some old photos for us - of the Docks, of the hydrofoil that for a time ran a service from Southport across the river, and of a banana boat passing the west end of Lytham green. He also has some pictures of himself and other people diving off Stainforth Force! 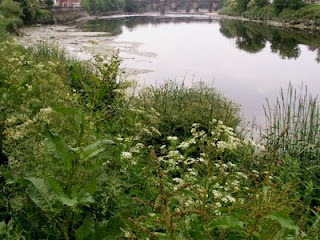 When we have asked local people to tell us why they value the Ribble so much, it is remarkable how so many say pretty much the same things about the River Ribble and its green spaces, and show a very deep connection with these unique assets. On a personal level, I love the fresh air that the river brings, the wildlife and the tranquillity. Alot of people drive miles (and sometimes have to pay) to see something of natural beauty and in my view the council or whoever, want to actually take that away (probably because they want to charge people!). I also believe that to build a barrage (I presume that it is still in the plans) would turn the river into a canal. It would then become smelly, littered and lifeless. ...The docks was a blank canvas, and I remember the talk of all the plans of hotels, up-market shops and a bustling marina none of which have materialised... I have no confidence whatsoever, that the vision these people have of Preston, is going benefit the people of Preston in anyway. ...In the early days when the idea first became common knowledge I tried to find out more about the plans and was told that, as I live South of the Ribble, it did not concern me, but, of course, it does, it concerns everybody." Alot of people are still raising concerns about the Preston Vision Board in particular, from its apparent lack of accountability or engagement with ordinary local people, to its unrepresentative membership (which is primarily businessmen). Aidan from Preston sent in this great quote for the blog, and it seems a particularly apt one to use here! “The pinnacle of human evolution is not a man in a business suit”. Thanks Chris, Razzi, and JB, Geoff, Aidan, and NM, and thanks to everyone for sending in your comments and pictures.